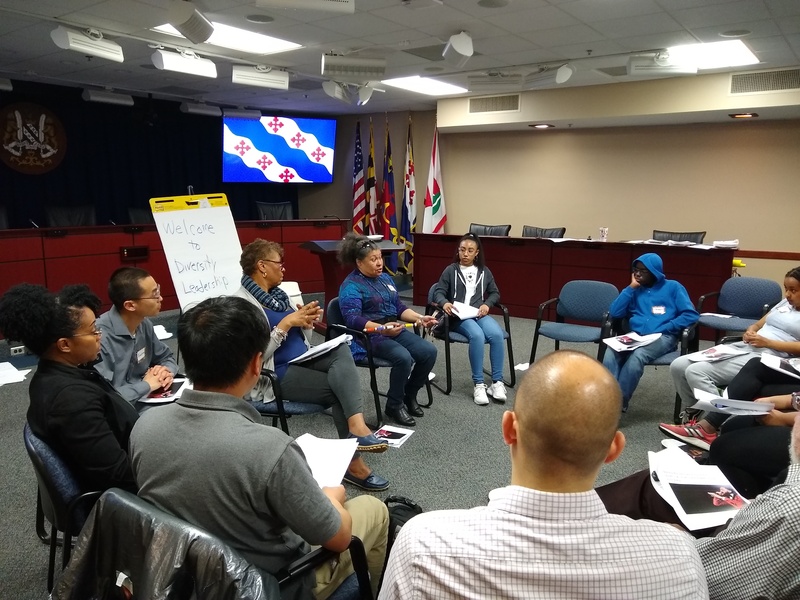 Since 2014, I have coordinated the City of Rockville, Maryland’s spring Diversity Leadership Workshop for youth. The program is sponsored by the city’s Human Rights Commission (where I served as chair between 2014-2016). This is time that I give to my community to share with young people important notions of diversity, tolerance, acceptance, and ways of engaging as leaders. This year’s workshop was held on Saturday, April 13, 2019. This year’s program included a smaller number of area students, but more members of the Human Rights Commission where involved. Having a program that brings both adults and youth together has important advantages. It allows adults to hear directly about the needs of young people (we often make assumptions), and allows young people to have their views validated. This is followed by an exercise looking at stereotypes. Block paper is placed around the room with categories listed such as African-American people, single mothers, students from other area high schools, and similar groups. We then had students move around the room and list the stereotypes they see about these groups. This gives us a chance to air stereotypes and talk about their impact. Andrew Lin, who is a commissioner, did a great job with this activity. This was followed by Mary Baltimore talking about the notion of internalize oppression. This can relate to marginalized people dealing with oppression of their group, sometimes even coming from members of that group. Her story is always powerful, that she share about her own experiences growing up in the south. Before lunch, I had the students create their own emblems or “coats of arms” from paper plates. This is a great way of young people sharing about their “identity” and interests. During lunch with year we had representatives from Coming to the Table (CTTT). Jane Carrigan and Nancy Spencer shared about the group’s work, which focuses on healing the wounds of slavery in the U.S. Jane and Nancy are connected with the Annapolis, MD chapter. CTTT is based at Eastern Mennonite University. In addition, Juan Fogelbach talked about coming to the U.S. as an Salvadoran immigrant and his work as an immigration lawyer. He asked students, who were mostly from immigrant families, to share about their experiences. After lunch, we looked at applications of leadership. Using scenarios that I have created, I asked the students to develop skits looking at how they might respond. I’ve attached one of the scenarios I used this year. This is a great opportunity for students to apply their knowledge. Then commission Gabrielle Zwi looked a music and poetry. She performed for us a song she wrote dealing with diversity, and then we talked about the lyrics. She is a great performer and writer! Finally, Janet Kelly, who is the city’s commission liaison, and Courtney Proctor, the commission chair, led a discussion on what the students might do collectively on issues of diversity. Students committed to continuing to work together, across their schools.